I have been working on refreshing my laundry room since New Years. Literally New Years Eve, talk about a new beginning! 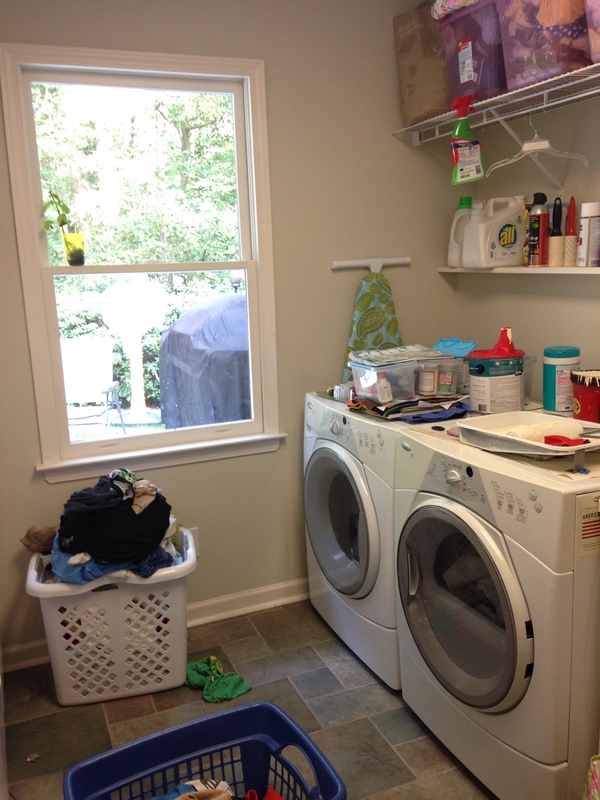 My Aunt, an interior designer, was visiting and I commented how frustrated I was about my laundry room. Seriously, so embarrassing to share these pictures! 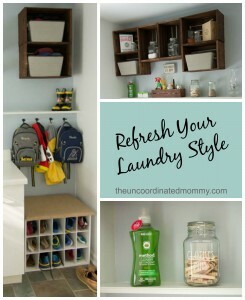 So she helped me out with some easy ways to refresh your laundry room with storage and decor ideas! 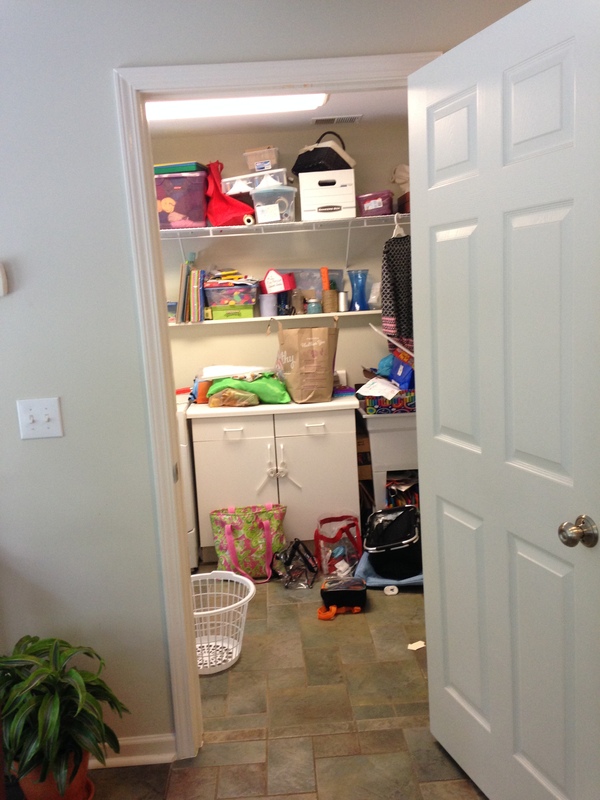 It was tough, but I had to pull everything out of there that did not belong in a laundry room or a mud room. Those were the primary purposes of this room so I needed to start with purging stuff! 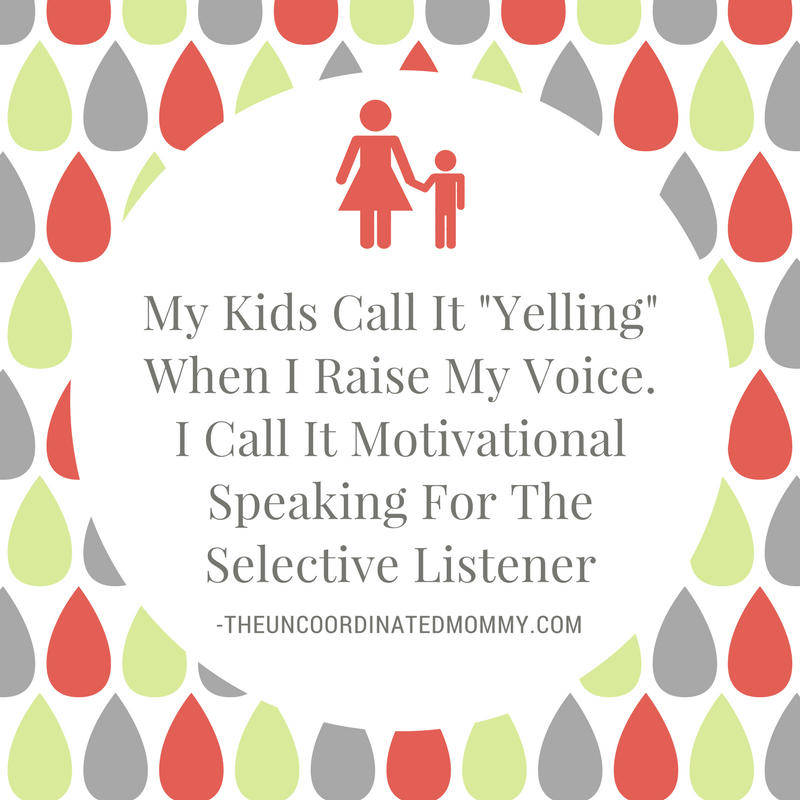 It was hard but felt so good! While it was great to get so much stuff out of the room, I still had a need for storage but not nearly as much as before! First we removed the less than attractive metal shelving and stained and installed these wooden crates from Home Depot. We used pre-drilling screws to keep the wood from splitting and made sure to drill into the studs for support. These are very sturdy but I would not suggest putting lots of heavy items in them. These two baskets contain cleaning rags and light bulbs. 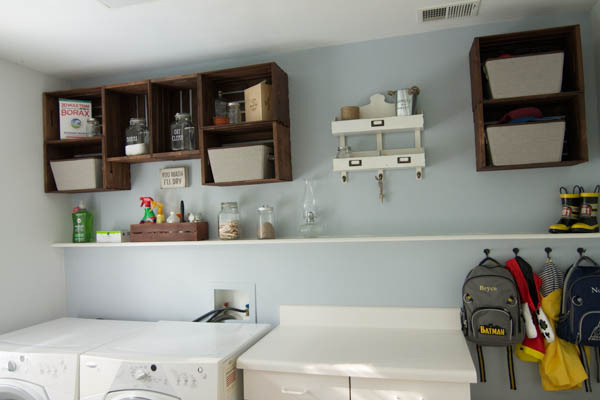 And the basket on the lower shelf holds laundry/cleaning items and a mason jar full of tea lights. This side of the room is our mud room. 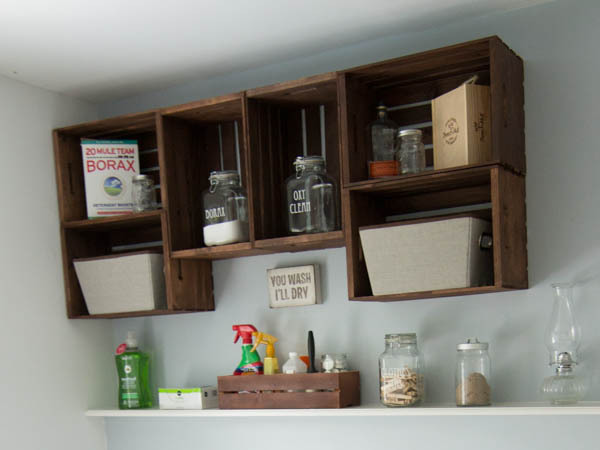 The storage baskets above contain seasonal items. The bottom has summer items (caps, sunscreen, and visors) and the top is for winter (hats, mittens etc) when it gets cold I just switch them! Instead of buying one of the boards with hooks already on them I grabbed four individual hooks from Home Depot for $8. The is the perfect place to hang the boys backpacks and rain jackets. The shoe cubby below came from amazon and we measured a piece of plywood which we covered with batting and burlap to create a shelf/seat to sit on top of the shoe cubby. Now the boys have a place to put there shoes and hang their coats! The last piece of the puzzle was the most fun! All the little decor ideas. Since we had the wood crates that meant a more rustic vibe. We grabbed jars from Walmart and used my silhouette to create labels. 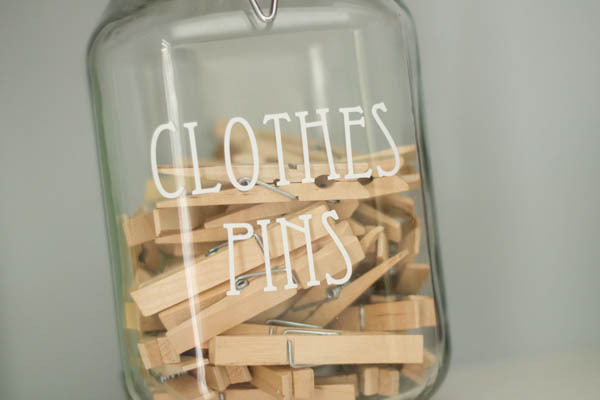 I also have random mason jars tucked away to hold things like tea lights and loose change and I grabbed the white shelf container in the center with the key hooks from Kohls. I still have some more accessorizing to do but I am already SO much happier with the way it’s looking!! I’m also a big fan of cute AND functional products. 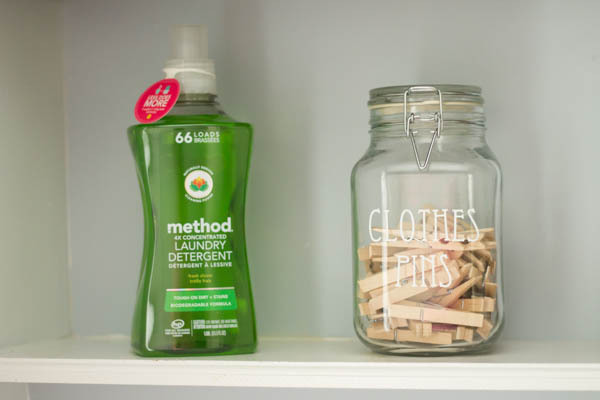 I love this method laundry detergent bottle. If i’m going to be looking at it every day, and with two small boys we do laundry EVERY day, then I want it to be cute! It is the perfect way to refresh your laundry style! 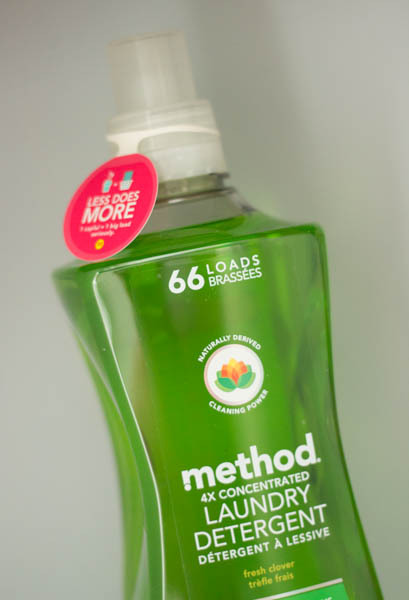 The method bottles have been newly designed to include an easy-to-use grip on the bottle instead of a handle because handles on bottles make them not fully recyclable. These bottles are also made with 100% post-consumer recycled materials and is fully recyclable! I also like how it’s clear. There is no guessing when you are getting low. This is actually the first laundry detergent bottle to be transparent! ASOS has also teamed up with method to create a 100% machine washable clothing line. The spring line is all about “uniting functional fashion with gentle clothing care for long-lasting wear.” You can use the method coupon code: THREEFORME for $3 off your online purchase at methodhome.com!